The POD's well-earned reputation precedes it, and now Line 6 has delivered a unit specifically designed for the stage. While Floor POD doesn't have the sonic flexibility of the original POD, it has enough features to appeal to a wide range of users. If you're the type of player who needs several sounds per gig, but finds most multi-effects units baffling, this could be what you need. For this sort of money, you have quite a few options, but Line 6 is a trustworthy brand, so its products will always be attractive. Excellent user interface, despite the navigation compromises. Slightly flimsy feel to the expression pedal. If there's one thing you can say for Line 6, it's that it never rests on its laurels. Of course, the ability to invest quickly in a major new product, capitalising swiftly on new trends, is usually limited to only the biggest and richest companies. However, not all of them are so keen to ﬁll in the gaps in their product ranges as Line 6. The digital modelling pioneer from California has constantly re-evaluated the possible applications of modelling, covering guitars, effects, amps and just about every point in between. Despite its huge success, the iconic POD has always been limited by its 'desktop' format. Not everyone wants to buy different gear for studio and live use, so there has always been a demand for ways of adapting the POD for stage purposes. The ﬁrst solution was a pair of foot controllers, but these were considered quite expensive on top of the price of the POD. Similarly, the powerful and versatile PODxt Live is out of the price range of many players. On the other hand, the AM4 was too simple, lacking any effects. 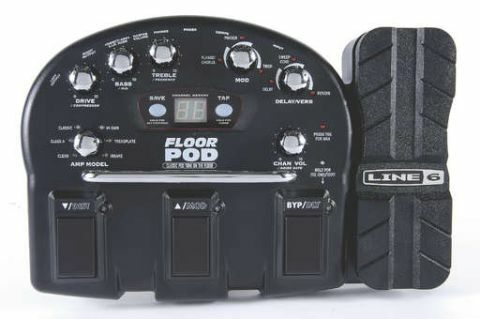 No worries, though - Line 6 has come up with yet another take on the 'amp modeller with effects' format, in the shape of the Floor POD. As you'll see, it's like a stripped-down POD in pedalboard form, but with a few useful extra features and a competitive price. Firstly, the layout. With three footswitches and one expression pedal, Floor POD is quite a compact unit. Although the base is metal, the main moulded shell, pedal and footswitches are all made from plastic. Nonetheless, it feels reassuringly sturdy, and a generous supply of rubber feet should prevent it from aquaplaning (or beerplaning) across a pub ﬂoor. A curved metal bar separates the footswitches from the main control panel, as on the PODxt Live, protecting against accidental adjustments due to overzealous stomping. While the more compact ﬂoor FX units save on ﬂoor space, especially in small venues, there's the inevitable compromise in terms of less ﬂexible navigation. In patch mode, the first two footswitches are used for scrolling up and down through the patches, while the third acts as a bypass switch. The 64 patches are stored in simple linear format, rather than being split into banks, so careful planning is needed for smooth onstage switching. You don't want to be jumping from patch 15 to patch 34 in the middle of a Dream Theater cover! The expression pedal normally controls the volume, but clicking the switch underneath the toe end converts it to a wah-wah pedal. For players who prefer the simple on/off choices provided by individual pedals, the Floor POD can be switched to a 'stompbox emulation' mode by holding down the third footswitch. The three switches are now used to turn the distortion, modulation and delay modules on and off (and in this mode the expression pedal works exactly as before). The main control panel will be familiar if you've ever used a POD before. The two-digit LED display is at the centre, surrounded by a crescent of controls. At the far left, in true POD style, is the amp model selector, although the Floor POD only has a rudimentary selection of six amp models (Clean, Class A, Classic, Hi Gain, Treadplate and Insane) offering a good overview of the most popular guitar sounds. As you turn the amp model selector, it passes through two basic settings for each amp type, one with higher gain than the other (indicated by red and green LEDs). There are only three controls for the amp models (drive, bass, treble) although these have dual functions. The save button works like a 'shift' key, providing access to the compression, mid-range and presence parameters. Similarly, the channel volume knob is also used to adjust the sensitivity of the noise gate. Saving valuable space once again, there's only a single control each for the modulation and delay/reverb effects modules. However, each knob covers three effects, with a third of the control's sweep given to each effect. It's quite a ﬁddly system, but visual feedback is provided by three red LEDs so you know instantly when you've gone from maximum phaser to minimum tremolo, for example. The Floor POD's user interface is clear and logical, and thanks to the predominance of big amp-style knobs (rather than pushbuttons) Floor POD has the same tactile feel of its siblings. That said, the expression pedal feels quite small and flimsy - possibly because of its plastic construction, possibly because it's quite short and has a relatively small sweep. That's only a minor issue though - the wah and volume controls work perfectly well. The sounds, both amp models and effects, all have quite a familiar sound, which isn't surprising. Although Line 6 seems to be aiming for the same classic amp-plus-stompbox vibe of the original POD, it's nice to see the addition of the Sweep Echo effect, which ﬁrst appeared on the DM4 and Echo Pro effects units. Some of the compression settings on the factory presets seemed a little high, resulting in quite a 'spongy' feel, but overall, there's a good selection of amp models here.